Statistics Canada announced this morning that employment increased by a stronger-than-expected 32,300 in March, driven by full-time job gains. The unemployment rate was unchanged at a four-decade low of 5.8% indicating that the economy is at or near full employment. In the first quarter of 2018, employment edged down (-40,000 or -0.2%) reflecting a decrease in January. On a longer-term basis, jobs have been on an uptrend since the second half of 2016 despite a price-induced weakening in the oil sector. Over the past year, total employment rose by nearly 300,000 (+1.6%), driven by a surge in full-time work and a net decline in part-time jobs–all excellent news for the economy. Over the same period, total hours worked grew by 2.2%. Employment rose in Quebec and Saskatchewan, while there was little change in the rest of the country. As the table below shows, British Columbia continues to post the lowest jobless rate in Canada at a stable 4.7% followed by Ontario at 5.5%. Quebec is third with an unemployment rate only slightly above the level in Ontario, its best relative performance in many years. The jobless rate at 5.8% in Saskatchewan edged up last month as it did in Manitoba. Alberta saw a sharp improvement as the jobless rate fell from 6.7% to 6.3% continuing the trend of recent months. Atlantic Canada continued to post the highest proportion of unemployed people. 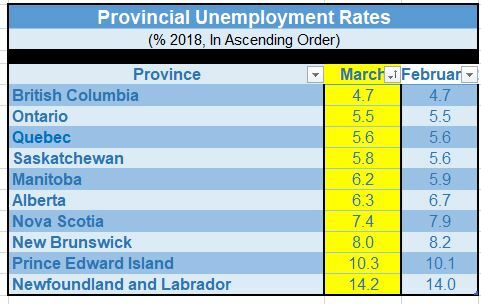 While the unemployment rate edged down in Nova Scotia and New Brunswick, it rose in Prince Edward Island and Newfoundland and Labrador. From an industry perspective, job gains were led by the construction sector (+18,300), representing more than half of the employment growth last month. This was the most robust performance for construction jobs since February of 2016. Compared with 12 months earlier, employment in this sector grew by 54,000 (+3.8%), mostly resulting from gains in the second half of last year. There were also gains in public administration and agriculture. The number of public sector employees rose, while the number in the private sector and those self-employed held steady. The number of people working in finance, insurance, real estate and leasing ticked down slightly last month while it declined -0.4% on a year-over-year basis. Manufacturing was a drag on the economy, with the sector losing 8,300 jobs in March, possibly reflecting NAFTA uncertainty. Another piece of good news for Canadians is that annual wage gains averaged a sizeable 3.2% in the first quarter of this year, the most substantial quarterly rise since 2015. The March jobs report reaffirms that the Canadian economy is very close to full employment with little slack left following Canada’s strong economic performance last year. “Normal” levels of monthly job growth are about 15,000 to 20,000. Wages have been showing signs of strength in recent months as labour markets have tightened. Annual pay increases accelerated to 3.3% in March from 3.1% in February. The Bank of Canada has much to weigh at its policy meeting on April 18. Growing optimism that a preliminary NAFTA deal is within reach has not yet triggered expectations for faster Bank of Canada interest rate hikes, particularly with rising U.S.-China trade tensions. Investors now wager there is about a 20% chance of an interest rate hike at the April 18 meeting, based on swaps trading, down from 40% two weeks ago. A BoC interest rate rise is not fully priced in until July. Even if a tentative NAFTA deal is signed, the central bank would likely wait to see concrete increases in Canadian exports, business investment and inflationary pressure before moving again after three rate increases since last July. The February trade figures released this week were disappointing, particularly for non-energy exports. Railway delays led to a record drop in food exports. Canada has reported trade deficits since January 2017, amplifying concerns about a decline in competitiveness. Before its April confab, the Bank will also analyze its own survey of business executives released this Monday to see how executives have responded to trade uncertainty and tight labour markets. The Bank of Canada’s business outlook indicators have been on a steady uptrend since the lows reached in 2015 and are hovering at some of the highest postings in the past 17 years. It will be interesting to see if enlarged global trade tensions have dampened business optimism in Canada. Payroll gains cooled following a strong February, returning the U.S. labour market growth to a more sustainable pace. Nonfarm payrolls rose 103,000 after an upwardly revised 326,000 advance in February. 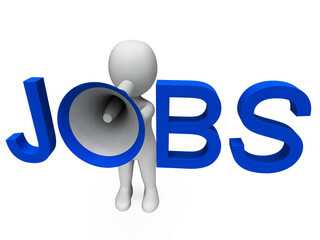 Markets had been expecting job gains of 185,000 with a downtick in the jobless rate. Instead, the unemployment rate held steady at 4.1% for the sixth month, while average hourly earnings rose 2.7% from a year ago. Monthly job gains are consistent with further declines in the U.S. jobless rate, which remains below Fed estimates of levels sustainable in the long run. The Fed policymakers recently forecast that the jobless rate would fall to about 3.6% at the end of next year. The likelihood is that the Fed will continue to tighten monetary policy by raising the fed funds rate and gradually unwinding its holdings of Treasury bonds and mortgage-backed securities. But the prospect of a possible trade war with China is a wildcard for the outlook, notably after President Trump raised tensions by ordering his administration to consider imposing tariffs on an additional $100 billion in Chinese imports.